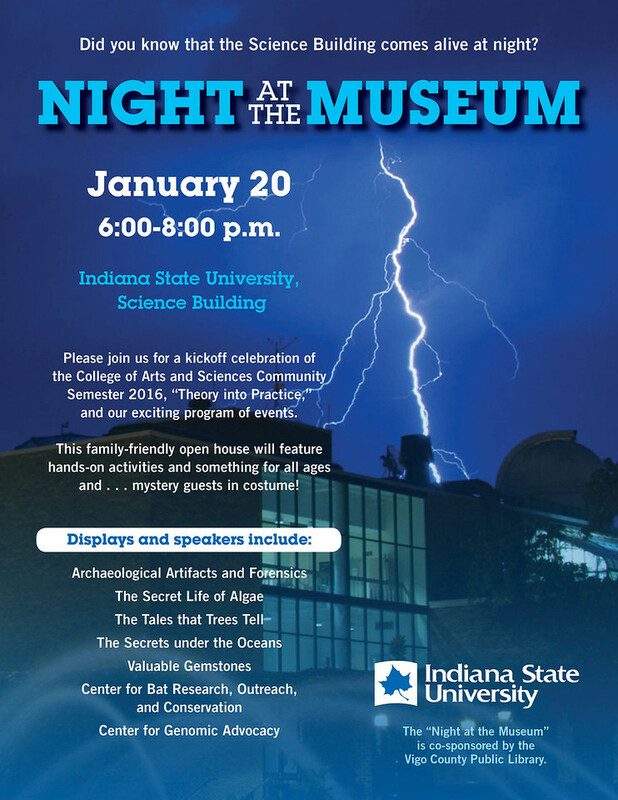 The College of Arts and Sciences kick off the fourth annual Community Semester at Indiana State University with a "Night at the Museum" 6-8 p.m. Jan. 20 in the science building. The halls will come alive with activities for all ages, as well as mystery guests (yes, Teddy Roosevelt will be there). "I was thinking I would have loved to be a kid walking through the science building with all its displays and specimens in the hallways. Then we thought, what if we did a ‘Night at the Museum' theme?" said Isaac Land, associate professor of history, referring to the movie of the same name. "It's like Halloween. It's great fun for kids -- even big kids!" The kick-off event is co-sponsored by the Vigo County Public Library. The theme of this year's Community Semester, "From Theory to Practice," highlights the importance of translating the "theory" that supports the fundamental disciplines in the College of Arts and Sciences to issues in everyday life, said Dean John Murray. "‘Night at the Museum,' is going to share our science departments with the community. There will be events for the whole family, so kids are encouraged to come," Murray said. Lectures and exhibits from various fields will punctuate the "open house" spirit of the program, meant to showcase the offerings of the College of Arts and Sciences to the community. February will feature a concert in the Tilson Music Hall with a pre-concert talk, "From Theory to Practice" by Erik Rohde. The science education student organization will also host a "Fun Science Afternoon" at the Terre Haute Boys and Girls Club, and the community will be able to peek behind the scenes of an upcoming theater production and learn about playwriting as well. "Women's Studies Month" will offer daily lectures Feb. 29-Mar. 4 in the Cunningham Memorial Library. "Open Source: An Art Exhibition" in the University Art Gallery will be open to the public through Feb. 19 and features artists, such as Buzz Spector, Mark Booth, Chris Walla, Lee Marchalonis, Katie Hargrave and Brett Hunter, who use text in their practice. In March, Catherine Steding, assistant professor of biology, will present at Westminster Village on health scares in the media, and April 5 will provide "CRAZY: A Father's Journey into Our Broken Mental Health System" by New York Times bestselling author and journalist Pete Earley in Dede I of Hulman Memorial Student Union. "Mediated Politics at Mid-Decade: Campaigns, Coverage and Controversy," a communications panel in April, will feature discussion of topics such as political polarization, public engagement, media-blame, local political coverage and gender by a distinguished panel of local experts. The community semester will close with "Last Lectures," 7-9 p.m. April 13 in University Hall. In the spirit of TED Talks, these lectures will take the form of short, filmed talks by Indiana State faculty -- Steding's "Health Scares in the Media," Associate Professor of art Brad Venable's "Night of Broken Glass," Professor of communication Mary Kahl's "How to Watch a Debate" and Land's "What is the Opposite of Genocide?" This event marks a new initiative in the Community Semester to make live events available as video clips on the college's website. The spring Earth Day celebration is also in the works at Indiana State, slated for April 20, when students can learn new sustainable living practices at the Sustainability Festival, 11 a.m.-2 p.m. on the quad and unwind with popcorn and a movie in front of the Condit House that evening. "I'm very excited about Community Semester 2016," said Murray, who sees the upcoming events as a way to bridge the gap between the so-called "ivory tower" of the university and connect it with the community. "This series of lectures, panels, art exhibitions, concerts and other activities are a wonderful way that the faculty in the CAS departments share the content of their disciplines with the citizens of the Wabash Valley." For a complete schedule, go to indstate.edu/cas/dean/community-semester-2016. The halls of the science building will come alive with activities for all ages, as well as mystery guests (yes, Teddy Roosevelt will be there). For a complete schedule, go to indstate.edu/cas/dean/community-semester-2016.